World Peace is an enduring ideal, despite reality, and one of my most popular themes. 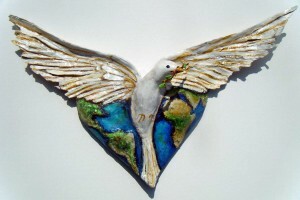 Each prayer for World Peace is hand sculpted and painted by the artist. No two are exactly alike. I have created two versions of World Peace: the traditionally colored version with darker blues and greens and the one pictured here in a the muted color palette. This particular piece is approximately 20″ x 23″ made from Papier–mâché. Contact me for purchase information or if you are interested in commissioning a piece.